adomedia had the most liked content! 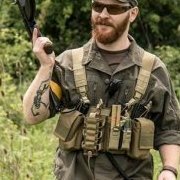 We are thrilled to announce that in the new year First and Only Airsoft will have three new sites opening across the UK! In the North we have "The Mill CQB" opening in Wigan with the first game on the 7th January 2017. Click here to book on. In the Midlands we have the "Academy 2.0" in Kidderminster with dates through the first quart already up. First game on the 14th January 2017, click here to book on. Opening in the South, "The Barracks" in Bordon Hampshire has its first game on the 17th December 2016, click here to book on. This Saturday at Bolton woodland will be a free members Open day for silver and gold First and Only members. To book on as normal via the online booking system please click here: http://www.firstandonlyevents.co.uk/missions/open-day-130/ This event is still open as an open day for more information please click here. "Having seen the ferns and other perfect natural cover last game we have decided to try a sample of game types for this open day. We will have a set of unique theme games, a long milsim style mission and some short tournament games. More details to follow... All are welcome: particularly if any of you wanted to try the non-standard game types but didn't know which was for you. See you there! " - Ric Click Here to Book Online! 7th June 2015 The Base CQC - Special D-Day themed event! A special D-Day themed event will be held at The Base CQC, Yatesbury on the 7th June 2015 at a reduced price of £25.00. This event is not to be missed! Click here to book now. The HIVE Evening Games - Now Every Wednesday! The Hive midweek missions are now on every Wednesday evening! Take on scenarios designed to challenge even the most experienced operators at The Hive, Warwick Mill, Manchester. Find out more here. Don't miss out on extreme CQB action! Sniper Hunting Milsim! On Sunday 19th Ocotober Snipers will be hunted in the woodlands of Khe Sanh, Otley. This will be a Military Simulation event, more information on the can be found here. On Sunday 21st September, The End of the World Game! will take place at Khe Sanh Woodland. This Special Event will be a story led game, more information on the scenario can be found here. Location: THE EXCHANGE AINSWORTH STREET BLACKBURN BB1 6AD Game Day Schedule Doors open 8.15am Safety brief 9.30am Games start 10.00am Lunch 12.00-13.00pm end day 16.00 Cost Walk on – £30 (Silver £25/Gold £20) Lunch is not provided at this site. Hire – From £15 Hire Package 1: Gun, Mag full of BB’s, Full face mask, Protective clothing – £15.00 Hire Package 2: Gun, Mag full of BB’s, Full face mask, Protective clothing, Tactical combat vest, Extra mag, Bottle of 3000 BB’s – £25.00 There will be no hire kit on site, please contact Jamie on 07786 75129 to pre-book and arrange for any hire kit you need. Pre-Site Rules: The site limit is 328 fps on .2 g bbs a variance of up to 350fps is allowed. Pyro: Re-usable Pyro only. As fizzy pyro will set of the sensors. BFG's with .22 or .209 shot gun primer only. There will be only be two impacts and four timed grenades available for hire on the day (18+ only), priced at £10 includes 10 blanks. (Please Note: If used incorrectly hired grenades can be removed from play with no refund) BBs/Ammo: Only plastic BBs which do not shatter on impact are allowed on our sites. For Hire Guns, Only bbs sold at our site are allowed in our hire guns. Please Note: For ages 13 to16, please ring in advice regarding parental consent and adult supervision on the day. Facilities: Toilet, Road Parking, Refreshments, Charging Facilities First and Only Retail Mobile shop (Gold and Silver 5% Discount apply) Contact the shop at [email protected] or 07763125315 if you wish the shop to bring anything specific. Info: If you have any questions please give Jamie a call on 07786075129 9am-5pm or email [email protected] Please book in below: (Example below) Jamie Forrest , own kit . or Jamie Forrest , have confirmed Hire. Open Day at The Asylum this Sunday 25th May!